Workers at Flint Assembly Plant put the final touches on a heavy duty Chevrolet Silverado pickup. GM officials announced Monday that increased demand for the company’s trucks have prompted the company to add a third shift to the plant. FLINT TWP. — General Motors workers across the region have reason to smile in the wake of the automaker’s announcement Monday it will add a third shift and 750 employees to its Flint Assembly Plant. The plant, located on Van Slyke Road, can be seen from I-69 and has been a part of the Flint skyline since 1947. It currently employs nearly 2,100 hourly and salaried employees and operates two production shifts. In 2010 the plant produced 115,000 trucks, the majority of them regular and crewcab versions of the heavyduty Silverado and Sierra. 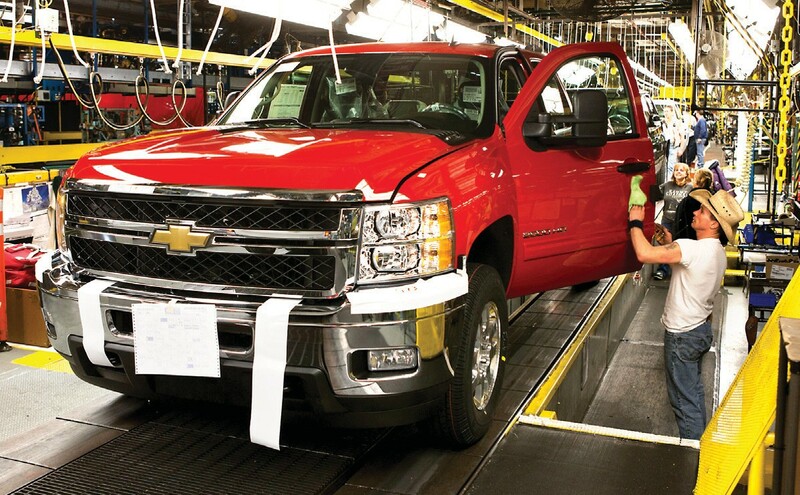 Last year, the plant added production of regular and a crew-cab version of the light-duty Silverado. Art Reyes, president of UAW Local 651 in Flint, said this is the largest call back of GM workers in the area since the company rebuilt the Flint Engine Operations eight years ago. “It’s a boon,” he said, that will go a long way toward helping revitalize Flint and the surrounding areas. “It’s one more example of, ‘Thank God we were able to get the bridge loans,’” said Reyes. Although GM isn’t expected to begin producing trucks on the third shift until the third quarter, the first wave of employees are expected to arrive at the plant sometime between April and June. Recalled employees will arrive in waves at the plant through the summer and early fall. A GM spokesman said initial openings will be filled by recalled laid off Flint Assembly employees currently working at other facilities, primarily in Lansing. Remaining openings will be filled by laid-off employees in the area, including those from Orion, Willow Run and Warren in accordance with the UAW GM National Agreement. No new employees are expected to be hired. Reyes said it’s likely the recalled employees will be back at the pay rate they had when they were laid off. Flint, the company put “34 brand new workers” on the job Monday and has another 34 new jobs in the pipeline. Assembly Plant Manager Amy Farmer. Local 598 Chairman Dana Rouse.